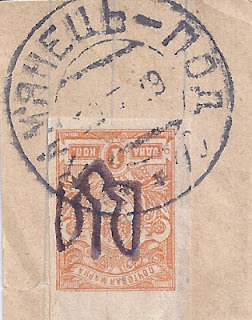 Back on 24 September 2011 I showed a cover from Dr Seichter's collection with a Cyrillic but Polish-derived cancellation [ KAMIENIEC] for Kamenetz Podolsk dated May 1920. I had no other examples to compare it with. Now I show a document dated 10 June 1920. This was prepared by the Executive of the Jewish Community, using a bi-lingual handstamp top left. It is franked with three Polish fiscal stamps, with the "Z.Z.W." overprint applied to those used in the East. But these stamps are cancelled with a seal of the same Jewish Community Executive - and incorporating a Ukrainian Trident. The document attests to the tax status of one Gitli [Hitli] Urman in relation to the Jewish Community. 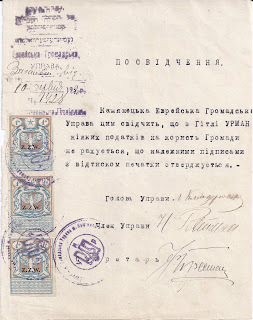 It's a most interesting - and I guess, rare - document which shows that the Polish occupiers had at least some kind of civil administration in Ukraine - enough to put fiscal stamps into the hands of a local organisation. 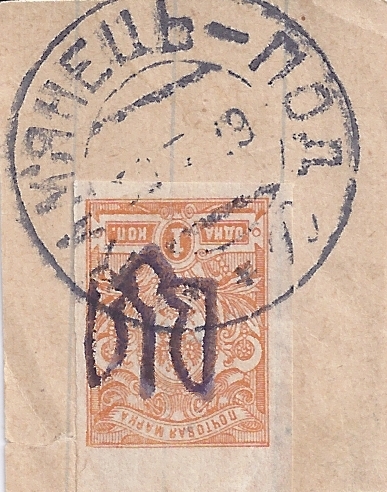 The stamps cancelled with this postmark (always philatelically) are often late prints or fakes. 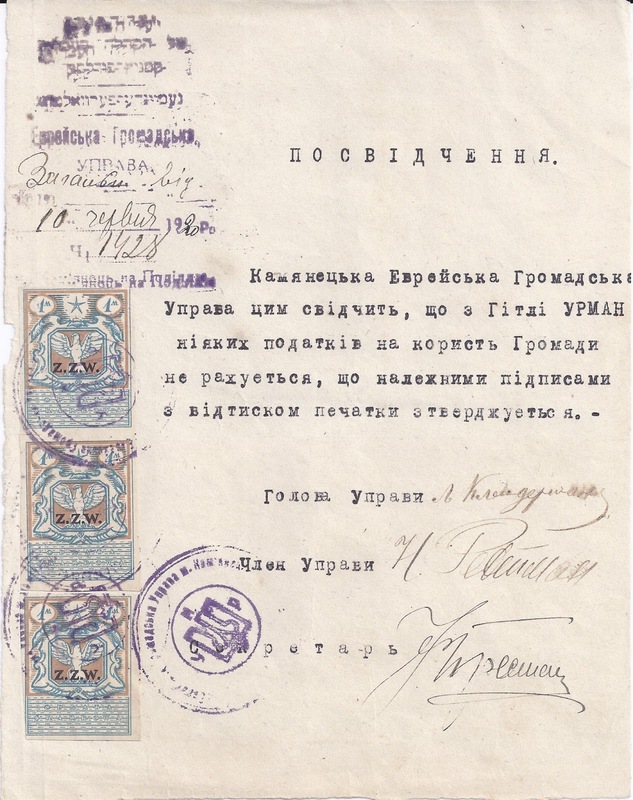 But it is I suppose conceivable that the cancellation is genuine and thus a rare example of a Ukrainian-language cancellation from the 1918 -20 period. But I would want to see it used on a Money Transfer Form before accepting that conclusion.